Russian Venus probe. Venus lander intended to study the Venusian atmosphere and other phenomena of the planet. Venus lander, Russia. Launched 1970. AKA: 3V;3V (V-70). Status: Operational 1970. First Launch: 1970-08-17. Last Launch: 1970-08-22. Number: 2 . Gross mass: 1,180 kg (2,600 lb). After aerodynamic braking, a parachute was deployed, the capsule antenna was extended, and signals were returned. The capsule was the first man-made object to return data after landing on another planet. More at: Venera 3V (V-70). Family: Venus. Country: Russia. Engines: KDU-414. Launch Vehicles: R-7, Molniya 8K78M. Projects: Venera. Launch Sites: Baikonur, Baikonur LC1, Baikonur LC31. Agency: MOM, Lavochkin bureau. Bibliography: 2, 296, 6, 64, 65, 13335. 1970 August 17 - . 05:38 GMT - . Launch Site: Baikonur. Launch Complex: Baikonur LC1. Launch Pad: LC31. LV Family: R-7. Launch Vehicle: Molniya 8K78M. Venera 7 - . Payload: 3V (V-70) s/n 630. Mass: 1,180 kg (2,600 lb). Nation: Russia. Agency: MOM. Program: Venera. Class: Venus. Type: Venus probe. Spacecraft Bus: 3MV. Spacecraft: Venera 3V (V-70). Decay Date: 1970-12-15 . USAF Sat Cat: 4489 . COSPAR: 1970-060A. Venera 7 was launched from an earth parking orbit towards Venus to study the Venusian atmosphere and other phenomena of the planet. 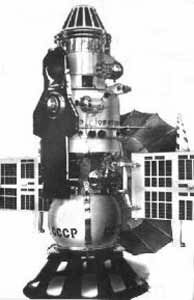 Venera 7 entered the atmosphere of Venus on December 15, 1970, and a landing capsule was jettisoned. After aerodynamic braking, a parachute system was deployed. The capsule antenna was extended, and signals were returned for 35 min. Another 23 min of very weak signals were received after the spacecraft landed on Venus. The capsule was the first man-made object to return data after landing on another planet. 1970 August 22 - . 05:06 GMT - . Launch Site: Baikonur. Launch Complex: Baikonur LC31. LV Family: R-7. Launch Vehicle: Molniya 8K78M. FAILURE: The escape stage Block L's engine 11D33 was late igniting and cut off early at 25 seconds after firing due to abnormal operation of the sequencer and a DC transformer failure.. Failed Stage: U.
Cosmos 359 - . Payload: 3V (V-70) s/n 631. Mass: 1,180 kg (2,600 lb). Nation: Russia. Agency: MOM. Program: Venera. Class: Venus. Type: Venus probe. Spacecraft Bus: 3MV. 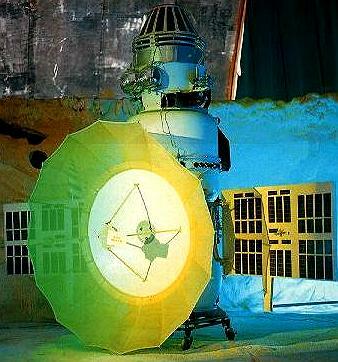 Spacecraft: Venera 3V (V-70). Decay Date: 1970-11-06 . USAF Sat Cat: 4501 . COSPAR: 1970-065A. Apogee: 908 km (564 mi). Perigee: 195 km (121 mi). Inclination: 51.2000 deg. Period: 95.70 min. Probable Venus probe failure..
1970 December 15 - . Venera 7, Venus Landing (USSR) - . Nation: Russia. Spacecraft Bus: 3MV. Spacecraft: Venera 3V (V-70).